Community Preservation Fund Advisory Board Chairman Gordon Gooding making the case opposing purchasing Vincent Novak’s property before the Town Board Tuesday. Those in favor and opposed to the acquisition of a half-acre property to preserve along Fresh Pond using Community Preservation Fund (CPF) money brought some new arguments to the Town Board Tuesday. Section of the town dump burning back in April 1964, before the practice was banned in favor of a landfill operation. 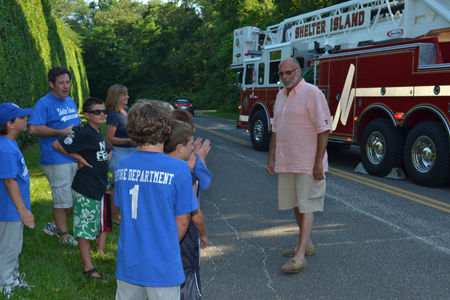 REPORTER FILE PHOTO | John D’Amato meets with Fire Department Little Leaguers. This year’s Fire Prevention Theme for Fire Prevention Week, which starts October 7, is “Have Two Ways Out,” Fire Chief John D’Amato informed the Reporter in a letter to the editor this week. • Make a map of your home. Identify the doors and windows that can be used to get out of each room. • Choose a safe place outside for a “meeting place.” This is where the family will meet to confirm that everyone has safely exited the house. You can then be ready to relay the family’s status to the first emergency responder. • When you practice, use your smoke alarm. This will help family members to react correctly when the alarm sounds. This is especially important to deep sleepers and the younger members of the family. During Fire Prevention Week, in conjunction with the Shelter Island School, the Shelter Island Fire Department will be hosting fire prevention classes at the main firehouse on Ferry Road. Everyone is welcome to come to these classes to learn about escape planning and other important fire fire safety techniques, Chief D’Amato said.